Joe Pagglia had always wanted a pet monkey. His friends and neighbors told him, "Joe, why not a kitty cat or a nice turtle? Monkeys may be cute, but they fling their poop. Who needs that?" But Joe was undeterred, and was soon the proud owner of a monkey named Barney. As everybody knows, monkeys hate to be cooped up, so being a proud and good pet owner, Joe Pagglia took Barney downtown for a stroll. Unfortunately, in front of the under-construction City Hall, Barney slipped his rope leash and darted up a palm tree. As Joe and several others struggled to coax Barney down, a crowd of about 600 spectators gathered to cheer them on. Enjoying his audience, or perhaps terrified of them, Barney leaped 15 feet out of the palm tree, and made a dash for City Hall. He then proceeded to scale the building, and in three minutes, was sitting on the Lindbergh Beacon. Pagglia went up to the 28th floor, and cajoled Barney into position. Then, he made a lasso, tossed it over Barney’s head, cinched it around his belly and hoisted his simian friend into Daddy’s loving arms. The Times reported that "hereafter, the monkey pet will occupy a cage in Pagglia’s backyard," which is terribly sad. But Barney seems like a crafty fellow – here’shoping he eventually made another break for it. 7 Go to, let us go down, and there confound their language, that they may not understand one another’s speech. 8 So the Lord scattered them abroad from thence upon the face of all the earth: and they left off to build the city. 9 Therefore is the name of it called Babel (confusion); because the Lord did there confound the language of all the earth: and from thence did the Lord scatter them abroad upon the face of all the earth. 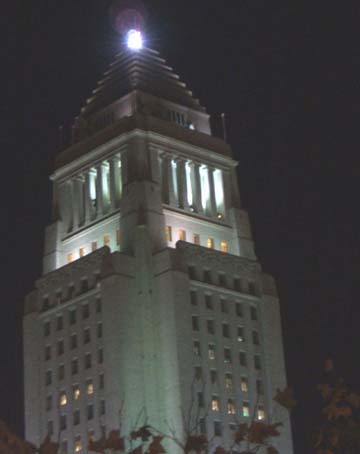 Here’s one of my favorite views of Los Angeles: City Hall at night with the Lindbergh Beacon. 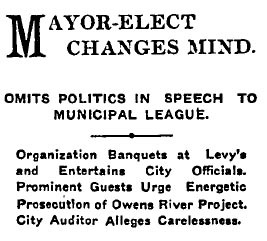 During a dinner at Levy’s, Mayor-elect Arthur C. Harper stood before 200 members of the Municipal League and their friends who were eager to hear what he planned for his incoming administration. 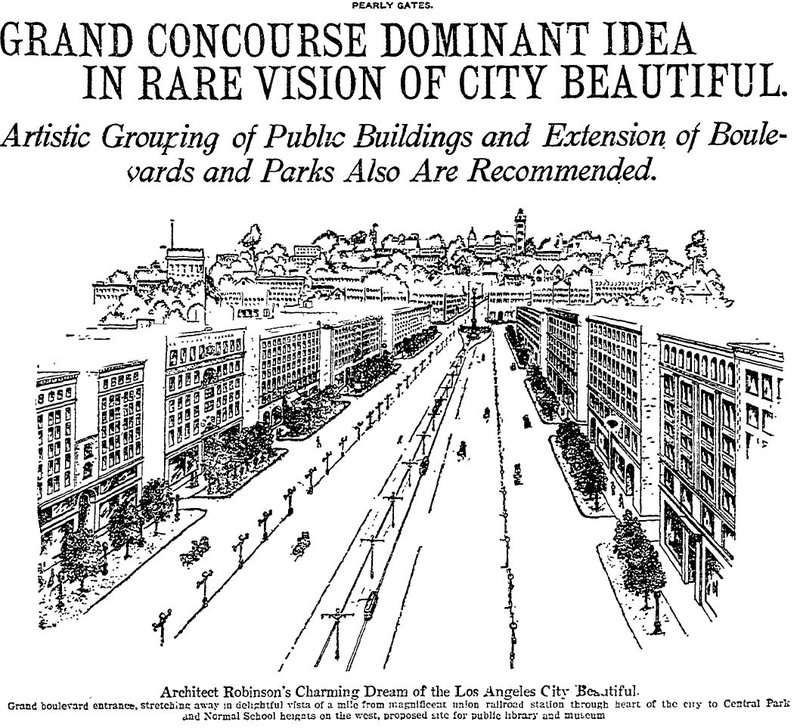 Architect Charles Mulford Robinson has drafted a proposal for downtown Los Angeles that is stunning in its ambition. One portion calls for broad boulevard leading from a proposed Union Station at Central and 5th Street toward Grand, ending at a new public library and art gallery. The other, equally elaborate, calls for a grouping of civic buildings and terraced gardens around North Spring Street, including a new City Hall. After repeated complaints to police because half a dozen dead dogs had laid in the streets for two weeks, the health department tried to charge C.T. 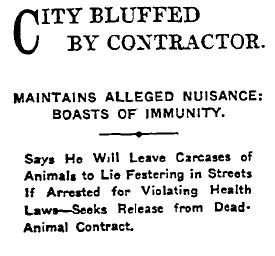 Hanson, who held the contract for removing carcasses. But according to the city attorney, Hanson was only guilty of not abiding by his contract and nothing more. In fact, Hanson had tried to get out his contract, claiming that he was losing money, but the city refused.